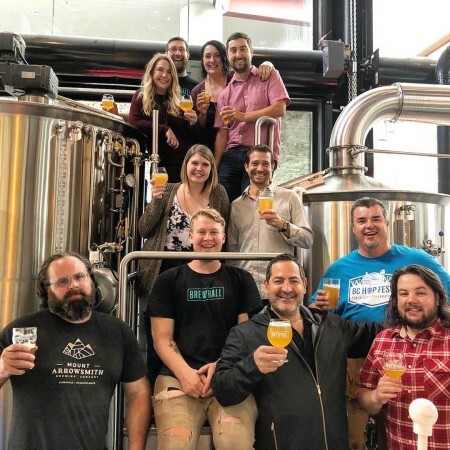 VANCOUVER, BC – The BC Beer Awards has announced details of its first ever collaboration brew, with proceeds to benefit a new grant for brewing students at Simon Fraser University. Group Project was brewed with German malts provided by Brewers Supply Group and fresh Lumberjack™ hops, generously donated by BC Hop Company, picked at the farm just hours before brewing. These hops have notes of resin and citrus fruit along with a clean bitterness and floral aroma. Dieter, a traditional German Kölsch strain of yeast provided by Imperial Yeast, will build on the fresh lumberjack hops and malt backbone to create a refreshing and clean Kölsch-style beer. Group Project will be available on tap at the BC Beer Awards & Festival – taking place at the Croatian Cultural Centre in Vancouver on October 20th – as well as the three participating breweries and select craft beer bars in Vancouver and area. Proceeds from sales of the beer will go towards a $3000 grant that will be awarded to a student enrolled in the Craft Beer and Brewing Essentials program at SFU. For more details, see the full announcement on the BC Beer Awards website.